On the 21st to 23rd March, the Holi Mahotsav festival celebrates the triumph of good over bad. This fantastically unique event proves that 10 years of a community event is in full swing as you rid yourself of your old baggage. In the literal sense, you can donate unwanted household items and start the New Year with zero excess baggage. In the Indian tradition, during the Holi days of this festival, the objective is to remove yourself from clutter and start seeing colours of joy surrounding you, especially white and pure lights. Attracting hundreds of artists from India and around the globe, the festival taking place in Darling Harbour is apt since there’s always a flow of people and naturally, water. You can enjoy artists and performers show their talents in Sydney, enjoy sensational Indian vegetarian foods and check out the craft stalls. Only a 12 minute car ride from one of Sydney’s affordable hotels, Cremorne Point Manor, you can optionally hop on a ferry and a few minutes ride late, you’ll be floating to this exclusive area, overlooking the Harbour. Whoever says the best things in life are free is absolutely correct! The festival is free for all, is a great winner for attracting families, kids, groups of friends and tourists. As an added bonus, you can experience the event first hand as a volunteer, performing at the festival as an artist or promoting and selling your ‘it really needs to go’ home merchandise. So if you’re heading to Sydney and looking to check out a truly unique three day celebration and be part of cleansing yourself of all things excessive in life, head down to the Tumbalong Park and Chinese Garden Forecourt in the Harbour. Remember that the more you offload, the more relaxed you’ll be at the Manor, sipping a glass of wine as the sun sets, with lighter shoulders. The Campbelltown City Walk on the 9th March is a brilliant way to get fit, socialize and is hitting it’s 23rd year anniversary. This is a 6km walk for fun or if you’re really into pounding the pavements, you can challenge yourself with the 11km endurance walk. The cool part about the walk is that you can grab a group of friends, family members or work colleagues to join you. Even local sporting clubs get geared up for the big day that starts at the stunning Australian Botanic Garden, Mount Annan. The Walk also hosts a barrel draw set of prizes at the start of the race and at the presentation ceremony so not only can you stay fit but you can also be a winner! As the event is family friendly, the event course takes place in the Gardens so it’s safe, scenic and hopefully sunny. The website includes the details about getting your registration complete, for individuals and groups and the deadline dates for entry. Chest numbers and shoe tags are included in the registration and after two decades of the Walk, the committee’s nailed the ease of registration to a fine art. The gardens are a one hour drive south west from Cremorne Point Manor so if you’re thinking of visiting the city and looking for an affordable hotel in Sydney, look no further. After a full day at the Gardens, making new friends, winning barrel prizes and learning how the shoe tag system works (it’s easy, trust us), head back to the Manor and put your feet up to watch the sunset and Harbour skyline. Put your best foot forward and have a brilliant day of exercise! On the 8th and 9thth March, Sydney’s the place to be where Top Gear Festival puts the brakes on all other entertainment. Only 45 minutes drive east of the city, this two day speeder of an event takes place at Motorsport Park. This is actually ideal because you can stay in an affordable Sydney hotel and in moments, you’re on the M2 gliding you to the M7, direct to the Park. For a full day with the family (yes, the event loves kids) the cost is only $160. If you’re planning to grab tickets with friends, a day’s worth of oogling over the best cars in the planet is a simple $69. Remember those catastrophic three wheeler Robin Reliants? You may spot them on the field trying to play huge soccer between country teams. Then there’s the Infiniti Red Bull Racing Formula One along with the Holden State Origin Car Challenge. This is where you can celebrity spot National Rugby League legends from NSW and QLD battling it out with challenges. If you’re a huge fan of Aryton Senna, then you’re in luck. He’ll be featuring his MP4/4 which was raced in the 1988 Formula One championship. Obviously it’d not be a Top Gear extravaganza if Jeremy Clarkson wasn’t showing up. He’ll be there! Alongside legends including James May, The Stig, Craig Lowndes and Daniel Ricciardo. When you think the line-up is extraordinary, also remember that six of the world’s most powerful engines will go head to head for the King of the Track title in the Ultimate Speed Showdown. This includes the TeamF1, TeamSuperbike, TeamV8, TeamGT3, TeamWorldTimeAttack and TeamWRC. Wheel (pun intended) be expecting you’ll need a relaxing evening, overlooking the Harbour sunset from Cremorne Point when the sun goes down. Get revved up and start your engines! If you have a huge romance brewing 13th February brewing, don’t presume we’re mentioning Valentine’s Day incorrectly. It’s the Australian Surfing Awards and this annual event is a huge extravaganza in Sydney that surfers love. Commencing in 1985 by the Australian Surfriders Association (now called Surfing Australia), the awards honor the greatest achievers each year. Incorporated into the Hall of Fame, the surfers who have made the most significant contribution to this fantastic industry and sport are given the honors. So if you’re a boogie boarder and only hit the surf twice a month, then you’re out of luck. But on the plus side, the Award recognizes the broad spectrum of individuals and organizations in a variety of categories. It doesn’t mean that you’re potentially in the running if you dabble your feet in the sea. It does though, honor all the individuals from event planning, media, travel, new initiatives and all things related to the sport. Maybe you’ve taken incredible photos of surfers while the battle the waves? Or you’re a business that’s greatly supported the industry over the past year? All those movers, shakers and wet suit participants that truly have changed surfing, are recognized. The Harbour will be buzzing around this time of the year, as thousands gather to see everyday surfers in action, while the adrenaline heats up in the city. 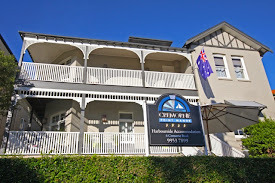 Looking for affordable accommodation in Sydney? Then Cremorne Point Manor is the best resting spot, especially since it overlooks the Harbour so you have prime viewing of local and international surfers, before and after they celebrate the awards and ride the biggest wave of the year!